Five years ago I interviewed Casa Fuente General Manager Michael Fayerverger for one of our first “Cigar Insider” interviews. Over half a decade later, I decided to check back in on Casa Fuente, one of the most iconic cigar destinations in the U.S. 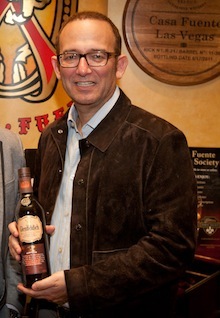 This time I interviewed Michael Frey, proprietor of Casa Fuente (as well as Rhumbar) in Las Vegas. Our discussion included my favorite drink on the Casa Fuente menu, a new Casa Fuente blend, and the Aruro Fuente Cigar Company’s 100th anniversary. Stogie Guys: How have the past five years been? Michael Frey: Business has continued to grow over the past five years and each year we’ve added a lot of new customers who love the experience and continue to come back. SG: Even though we’re doing this interview by email, I suspect you have a cigar lit while you write your responses. What cigar is it? MF: How did you know? It’s the new Casa Fuente Series 5 Special Selection 806. SG: You’ve added to the Casa Fuente cigar line this year. Tell us about the new addition. MF: It’s called the Casa Fuente Series 5 Special Selection. There are three cigars, the 806, 807, and 808. All three have a 50-ring gauge and range from robusto to short churchill. They feature a Havana-seed, Ecuadorian sun-grown rosado wrapper and the binder and filler are secret tobaccos from the Fuente’s farm blended by Carlito. SG: This year is the 100th anniversary of Arturo Fuente Cigars. Any special events planned at Casa Fuente? How about special cigars? MF: On the Saturday night of the Las Vegas Big Smoke, Carlito will be cutting a giant birthday cake. As far as cigars go, you never know what Carlito will do. SG: As the owner of Casa Fuente, you have access to some of the rarest Fuente cigars. Which ultra-rare Fuente is your all-time favorite? MF: I have two, the Brain Hemorrhage and the P.J. SG: Anytime I’m in Vegas I have to stop by for one of Casa Fuente’s Don Carlos Caipirinhas, which uses a tobacco-infused Grand Marnier float. I’ve had caipirinhas all around the world, including Brazil, but that’s my favorite. Can you shed a little light on that recipe? MF: The intense, smoky flavor comes from the Grand Marnier float which features an infusion of an aromatic pipe tobacco. It was developed by Francesco LaFranconi, a master mixologist for Southern Wine & Spirits here in Las Vegas. SG: Because of the warehouse fire that wiped out some of their most prized tobaccos, the Fuentes have said that some of their 100th Anniversary Celebration cigars will be delayed until next year. Any insight into what we can expect? MF: From what I understand, there will be an introduction of several new brands under the Opus X brand name, including the Angel Share which I smoked recently when Carlito came to Las Vegas for a visit. It was heavenly, living up to its name. Many thanks to Michael Frey for taking the time to answer our questions. If you even in Las Vegas, I highly recommend stopping by Casa Fuente for some fine cigars and beverages. Speaking from personal experience, it is well worth the trip. My personal favorite is a pairing of the original Casa Fuente cigar and a Don Carlos Caipirinha. I love this place! It's always a great stop in Vegas. A little difficult to find sometimes, but if you keep your nose open it will lead you to the promised land! I live in Vegas and love this place, but usually only go with friends visiting as the cost is a bit prohibitive for and every week trip. Do love it, as well as Rhumbar..